Vintage rock meets vintage gaming. 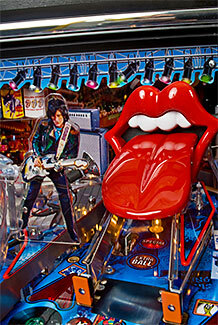 Gaming enthusiasts and pinball wizards can jam out with Mick and the band in Stern's Rolling Stone pinball machine! 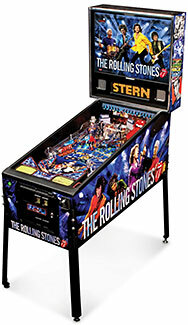 Playing 13 classic tunes from this legendary rock band, the Stern Rolling Stone full-sized pinball machine ($5699) features album cover artwork carefully recreated by Stern, a company whose history is well-documented within the pinball industry. This new pinball game allows players to accompany the band on a whirlwind concert tour spanning 40 years of rock 'n roll history! There are seven special features such as World Tour, Rock Star, and Licks that give players the ability to rack up points to rock 'n roll excess. After all main levels are unlocked, a Wizard Encore Mode brings even faster and more exciting high-scoring play! 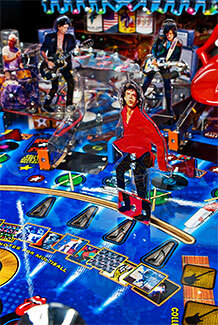 Other features include two all-new fast ramps, a moving Mick Jagger target plus multi-ball gameplay. The game features figures of band members and plays such classic Rolling Stones songs including "It's Only Rock 'n Roll", "Shattered", "She's So Cold" and "Start Me Up" to name a few. There is an outstanding three-dimensional version of the Rolling Stones' "Licking Lips" logo as a prop for this miniature pinball stage. The backglass and cabinet are both filled with images of the band in concert too. Dimensions are 75.5 x 22" x 55" (HxWxL) and weighs 250 lbs. Next up for Stern is their Metallica pinball machine scheduled for release in Q3 of 2013!